YUM. So, I know a lot of you have made my Bubble Up Enchilada Casserole (if you haven’t yet, do it – it’s one of my most popular recipes!). I’m not sure why it took me so long to make a pizza version, but it was definitely worth the wait. 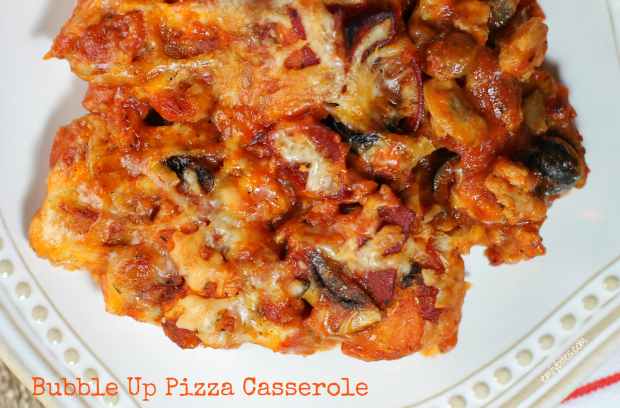 This Bubble Up Pizza Casserole is so good. It comes out of the oven hot, saucy and cheesy, with a spicy kick from the sauce and pepperoni and puffy mounds of baked biscuits bubbling up throughout. I added mushrooms (another favorite pizza topping) to make it heartier and black olives to give it a little twist. The result is all my favorite pizza flavors baked together in a hearty, crowd-pleasing casserole that comes together quickly for a perfect weeknight meal. Not only is this casserole fast, filling and delicious, but it’s also highly customizable. Feel free to mix in any of your favorite pizza toppings: onions, peppers, pineapple – you can’t go wrong! How do you eat your pizza casserole? *2015 Update* I tried making this with pineapple (replacing the mushrooms and olives) and it was incredible. Try it! Bring a large skillet or saute pan over medium heat and add the sausage. Cook sausage, breaking up with a spoon or spatula for a couple minutes and then add the mushrooms. Cook both for an additional 6-8 minutes until the sausage is cooked through in pieces and the mushrooms are softened. Stir in the tomato sauce, pizza sauce, pepperoni, olives, seasoning, pepper flakes and biscuit dough pieces until well combined. Transfer the mixture to the prepared baking dish and spread evenly. Bake for 25 minutes. Remove from oven and sprinkle the Mozzarella over the top. Return to the oven for another 15 minutes until hot and bubbly. What do you suggest as a substitute for mushrooms? I am allergic. Thanks! Becky, I don’t like mushrooms, so I always leave them out. If I feel I need more bulk in a recipe, I might add diced peppers. Do you think it’s possible to make it a day ahead of time and bake it the next day? Or do you think it would get gross? Hm, well I think if I did that I’d put all of it together except the biscuit pieces and then stir those in the next day before you pop it in the oven. Let me know how it turns out! YUM!! I am totally making this tonight! I love your Bubble Up Enchilada recipe, will definitely be making this! The recipe makes 6 servings! I’m assuming we can substitute sweet for the spicy sausage? We’re not spicy fans in my house. Any idea on substitutes for the biscuit ? It’s not available in Australia. WOW. This is amazing. I didn’t have any olives, so I used my favorite pizza topping of all time: ONIONS! I added them with the mushrooms. They got pretty soft, though, so next time I may add them a little later, or right before it goes into the oven. If I’d have had a bell pepper, I’d have used that, too. So easy and satisfying! Now I need to try the Bubble Up Enchilada Casserole! Yum!!! I added this to our menu for next week. 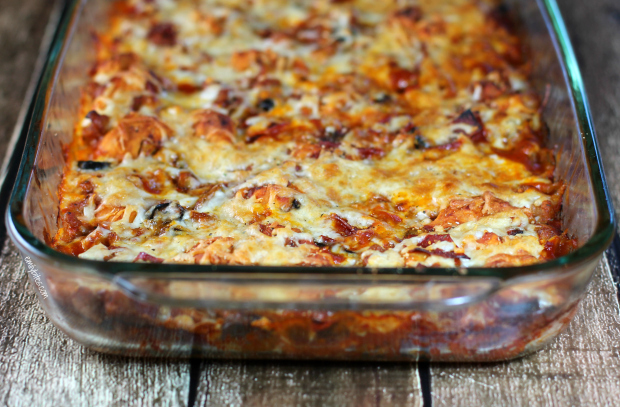 My family loves the Bubble Up Enchilada Casserole, so I’m sure we’ll love this too!! We have always made something like this with pizza dough on top, but I love the bubble up enchilada (due to the biscuits) and I am going to make this soon! Sounds delish! Thank you for your delicious recipes. I want to make this one but afraid I will overdo it. Would you say a serving is about 1 cup? I made this tonight and it was very delicious. I did have some issues with the biscuit dough. I am not sure if it is a result of my 9-year-old daughter repeatedly slamming the can of biscuits against the granite countertop in an unsuccessful attempt to open them, but once I opened the can, the biscuits had no shape and the consistency was that of a pile of goo. Did I let that stop me? No way! I ended up spooning the dough into the mix in the skillet. Unfortunately, it swirled around and blended in with the rest of the ingredients. I have to tell you, though: it was still delicious! I missed having actual biscuit pieces in my casserole (especially since I love biscuits so much), but when the dough blended with the other ingredients, it gave it a thick, viscous consistency that was hearty and kind of creamy. I am so happy the recipe wasn’t ruined. I will definitely be making this again and hopefully the biscuits will turn out right! This casserole is delicious!! My kids even ate it! Miracle of miracles! It’s a miracle!! Haha. Glad you all loved it! Since my husband’s favorite is the Bubble Up Enchilada Casserole, I figured we HAD to try this! It was excellent!! The only thing I’d say is it is VERY VERY salty, between the Sausage, Pepperoni, Olives, Cheese and Pizza Sauce. I wish there was a way to reduce some of that sodium, because I think I’m retaining about 10 pounds worth of water today from it!! I’d love to see a variation of this using Grilled chicken of some kind – not sure what kind of sauce or cheese.. Thanks so much for sharing, I fixed this last night and it was a hit, subbed green pepper for the olives, and it turn out great, I cooked them a little before adding them in so they would cook fully and not add too much moisture into the mix. Tonight we had a version of your Hawaiian chicken, which was also great, I made s few substitutions like using pork and canned pineapple to use what we had on hand. Tomorrow I’m trying the BBQ meatloaf. Your website has made my meal planning while starting weight watchers much easier. Thank you. I made this for dinner tonight…..My husband was amazed how good it was since it had Turkey sausage and pepperoni (he’s not a fan) he told me I had to make sure to make this again. Thank you for sharing!! Woohoo, glad we could convert him ;). Thanks for letting me know this was a hit! He didn’t make it but had everything sitting on the counter when I walked in the door. In a matter of minutes the casserole was in the oven. Since he forgot the pepperoni and neither of us like mushrooms, we substituted frozen broccoli for those items and the olives. After having had fast food and galley food for 2 weeks, this was HEAVEN. It was amazing. Absolutely delicious. After finishing the leftovers for lunch my husband confessed that he would rather eat that casserole than pizza from our favorite pizza place! This recipe has already found its way into our regular rotation AND inspired me to put the bubble up enchilada in the oven tonight. 🙂 Thank you for the amazing recipes! This is a wonderful recipe, just like the rest of Emily’s posts. I am actually eating this for lunch as I type! I have spent time each weekend making things from her site, dividing them into the proper serving sizes, and refrigerating/freezing them for breakfast, lunch and dinner every day. With recipes like this, I have lost 15 pounds in 6 weeks on WW. Thank you for the great resource Emily!!! I made this last week and this week and it was so delicious- this week I used 1/2 lb sausage and 1/2 lb lean ground beef and bumped up the mushrooms – plan to make it again next week and my family is already looking forward to having it again. Thank you for such delicious recipes and keep ‘me coming! What brand of sausage did some of you use? I couldn’t Italian turkey or chicken sausage at my store….unless I’m looking in the wrong place. Would reduced fat pork sausage work? Thanks! I made this tonight, and it was soooo good! Instead of buying sausage, I cooked ground turkey with Italian sausage seasoning. Thank you for sharing this recipe – I will definitely be making this again. I made this last night and it is delicious! I made it with the Jennie O Italian flavored turkey! Thanks for the great ideas! Amazing. My hubby and I loved this. Going to try with more veggies next time! Could you reheat this in the oven the next day? Our microwave blew up and we haven’t replaced it yet. Sure – you may want to put it in on a lower temp and cover it with aluminum foil to keep the top from getting too dark. Just made this tonight. My girls loved it and so did I. We’re not olive or mushroom fans so I did onion and green pepper. It was great! I’m so glad I found your blog! Everything I have made has been great! My girls also devoured the hash brown muffins for breakfast. This is sooo delicious!!! My husband loved it! It’s so hard for me to believe it’s only eight points! I’m excited for lunch tomorrow! Im not a fan of sausage on my pizza. If this is omitted, will it throw off the balance of the dish? May end up to runny or something? Thanks! It wouldn’t be very substantial without it, so you should probably replace it with something else. I am so excited to try this tonight! I left out the sausage only because I couldn’t find any so I had to change the recipe some, but Im sure itll still be delish! Hi Emily! LOVED this recipe! I made it without the mushrooms and olives because it’s just my 3 year old and I for dinner tonight and she’s awfully picky and it was still delicious! My husband works late tonight so he probably will just have leftovers. How does it keep? I’m just wondering if the biscuits lose their texture and get yucky in the fridge! Any suggestions?? Thanks for a wonderful recipe!! My husband would eat pizza every night if he could. I never make it because the recipes I have found are still higher in calories than I would like unless we only have 1 piece. There’s just something wrong about only 1 piece of pizza. I decided to give this a try and it was a big hit. The serving was big enough and there was so much flavor. I’m going to try an add more veggies next time now that I know how easy and tastey this is. All of these recipes look so amazing but I live in aus, so some ingredients I cannot get. Do you know what I could use instead of biscuit dough? Hm, it’s hard to say because I don’t know what products you DO have! I suppose you could make your own biscuit dough? I could suggest other ideas, but I won’t have tried them before so it’s hard for me to say what the results would be like. I have a skinny recipe for homemade BBQ sauce…is there one on your blog, too? I looked quickly, but didn’t see one. I’m thinking chicken, Canadian bacon or center cut bacon, onions & pineapple…yum! This was the BOMB! I have tried two of your recipes so far and I can tell ya I’m going to be trying some more! My kids have loved both of them! You are going to be a great aid to finding good tasting recipes while still losing weight! Thank you! Thank you!! Aw, thanks Cyndi! I’m so happy this was a hit with the whole fam :). Let me know what else you try! Do you think substituting the refrigerated biscuit dough for Pillsbury Gluten Free Pizza Dough would work? And swapping the Italian sausage for ground turkey or beef? I haven’t tried it that way, so I can’t say if the GF pizza dough would work similarly to the biscuits. If you try it, report back! You can certainly swap the sausage for anther ground meat. Emily…OMG. I am literally eating this right now, and I had to stop to comment and let you know how amazing this recipe is. I’ve made a lot of your stuff, and have never met an Emily Bites recipe I didn’t like, but this is INSANELY good. I subbed in green pepper and onions for the mushrooms, and it worked out perfectly. It makes you forget how WW friendly this is! A guilt-free pizza fix. Thank you! This is a great recipe! What I really appreciate about almost all of these is that they can be put together with a little work ahead of time and made at a future time. Even though being a housewife is my job, I don’t always have time in the evening to prepare and cook a proper meal. Being able to prep somewhat is a great thing, and I love that most of your recipes allow me to do so! Hey Emily… making this for dinner. Just a quick question, when baking do you cover the casserole or bake uncovered? Emily, this was absolutely amazing!!! I absolutely loved it and will definitely be making it again soon! This is definitely my favorite recipe of yours! I’m making this tonight and put this in the ww recipe builder. It came out to be 9 pp instead of 8 and thats without even adding the black olives. Could it be the sausage(Johnsonville chicken sausage) I’m using or something else? Thanks. Emily, girl, you are my Weight Watchers hero. Your blog is my go-to page for new recipes and so far I’m three for three of deliciousness! My favorite is the Bubble Up Enchilada, but I’ve recently tried the Chicken Tamale Casserole and I have Pizza bubble Up leftovers portioned out in my fridge as we speak. Thanks for sharing these great recipes with the world! Just made this tonight, added onions and bell pepper…delish! Hey! Im excited to try this tonight! Only thing is I noticed that I bought pizza dough and not the biscuit stuff! Do you think it would cook the same? or should I run to the store lol! Hm. Honestly, I have never used pizza dough in that way so I have no idea how it would perform compared to the biscuit dough. If you end up trying it, let me know how it works out! First off, your website is awesome…so many delicious recipes! The question I had on this one is if you could use the French bread dough rather than biscuit dough? I made this for dinner tonight I was craving pizza but not the points! IT WAS FABULOUS! Thank you! This is delicious!! However, I was using the recipe builder to try to build a bubble up meatball sub dish and the points seemed to be getting pretty high with similar ingredients, so I put this recipe in there and I ended up with 9 points plus per serving. I wonder what the difference is? Did you maybe use the larger Grands size can of biscuits? I figured it out – it’s the sausage. The ones listed in the recipe builder vary greatly! I guessed that you might have used the wegmans poultry sausage which is 13 pp but just choosing a generic is about 16 or 17 pp. What I use is comparable in nutrition to the wegmans sausage though. Thanks! Any way you can do a points breakdown for your ingredients??? I’ve made this twice and it’s beyond delicious, but with the ingredients I’m buying, I can’t get it below 12pp and 380 calories for 1/6 serving. Not sure what I am buying wrong!! Are you by chance using the Grands sized can of biscuits rather than the smaller can? Sausage can vary quite a bit as well. I use Wegmans brand poultry sausage. You can see the nutrition info for the biscuits I used by following the link I provided in the ingredients. Hope that helps! OMG this was so good! I’ve wanted pizza for weeks now and this crushed my craving! It was so easy to make too. My kind of recipe! I’ve been on WW for awhile (Lost about 40 lbs) and just found your website (what a goldmine ) and this was the recipe that spoke to me the loudest. I had to try it. This dish was Super-flavorful and very satisfying, but the sodium content is quite high per 1/6 serving (1,675 mg using the brands I chose). I know sodium isn’t a concern for many people but I try to limit it as much as I can. I will definitely be making this again but will try to rinse sausage after cooking to see if I can cut the salty flavor and the sodium and perhaps cut back the sausage amount and sub with more veg. Not sure if I missed it or not, so sorry if I did, but how much is one serving? Made this last night for the boyfriend and I; it was a HIT! I’m not a fan of olives or mushrooms, so I subbed a large Vidali onion, roughly chopped. The onion gave off quite a bit of water when cooking, so I drained the sausage/onion mixture before I added the rest of the ingredients. I was really worried about the consistency after all was mixed in (it was very soupy), but it baked up perfectly. I am not a big meat eater, so my boyfriend was pleasantly surprised to eat a homemade dinner full of meat. He raved about the dish the entire time he was eating! He said, “We are making this one again!” The portion is HUGE too. It will go great with my salad for lunch today! I made this and it was awesome! One point for others. I made it the day ahead and put it in the fridge for about 24 hrs and the biscuits did not “puff” up…..It was still delicious! Maybe this has been answered, but at the top of the recipe it says 6 servings at the bottom it say’s 8, just wondering which? Thank you! Do you mean where it says 8 per serving? That’s how many Weight Watchers points are in each serving. The recipe makes 6 servings :). I’m glad you liked it! Yikes, I see that now 🙂 Thank you for the reply! Hi Emily. Do you think I could use Ragu Veggie Spaghetti sauce vs the pizza sauce? Still using the same measurements. This looks like wonderful comfort food and the pineapple suggestion really intrigues me. My question is how well do the leftovers freeze and reheat? I am a widow and 6 servings would mean having it for lunch & dinner several days in a row. The pineapple is so good in it! I usually eat it for a few days too. I always just toss my leftovers in the microwave and I’m happy with it. I’ve never frozen it, so I can’t directly speak to that part but I’ve definitely reheated it a bunch of times. I hope you make it and love it, Kathie! Thank you for this recipe, I made it tonight and loved every bite. So did my husband! When I put this into the recipe builder it says it’s 12 points per serving. What am I doing wrong? I just plugged this into recipe builder and omitted the pepperoni and came up with 10 smart points. This was so delicious and filling! My husband even loved it and had an extra serving. One of my favorite recipes on here. Thank you! Made this for the first time last night & everybody loved it! The portion size is great for 9sp on Weight Watchers and it felt like I was eating a cheat meal. The flavor was extremely good & overall it had a kick to it, but wasn’t too spicy. I used “Honeysuckle White Hot Italian Turkey Sausage” & I substituted diced green & red peppers for the mushrooms & left the black olives out. I’ll definitely be making this on a regular basis! Thumbs up for yet another Emily Bites recipe! I was wondering about the olives. Was it a 4.5 oz of a can of olives or do I need to measure them out since the recipe said 1.5 ounces of olives? I don’t want to mess up the points. Thank you! I’m wondering why you used half pizza sauce and half tomato sauce? Consistency or flavor perhaps? Best recipe! Freezes very well!!!!! Have question about the biscuits do you mix them into the sauce to where they completely get gooey or do you leave them in chunks? What is the serving size? Is it 1 cup per serving? THIS WAS AMAZING!! We didn’t use mushrooms or olives because we don’t like them, but did add a green bell pepper. OMG, I can’t wait to eat the leftovers for lunch tomorrow!! Thanks for the recipe! I’m new to the group. How do I get your Bubble Up Enchilada recipe? I was craving pizza from my local pub and used this recipe to cure it! Added bell pepper and onion. This was a game changer for me. Thank you so much! I love this recipe so much. I forgot to get tomato sauce the second time I made it, so I used 4oz of pizza sauce and mixed it with water, and cut the cheese amount to keep it at 9 sp a serving. So deilicious!~ I also ditched the olives and added green peppers! I will be making this again, and again…. for vegetarians what do we replace sausage with? Hi Ramesh, you can try whatever you like! Faux meat crumbles, more vegetables, get creative! Do the bubble ups freeze well? We make all of them often but it always gets eaten. I’d like to make one for my sister in law for when she has her new baby but would need to freeze it. Bake and freeze or mix and freeze then bake? Could the two ingredient WW dough be used instead of the can biscuit? Any idea of the points minus the sausage? I made it tonight with just turkey pepperoni, mushrooms, olives and some banana peppers and it wasn’t delish!!!!! Nope, I only have the points calculated as written but you can definitely put all your changes in the recipe builder!